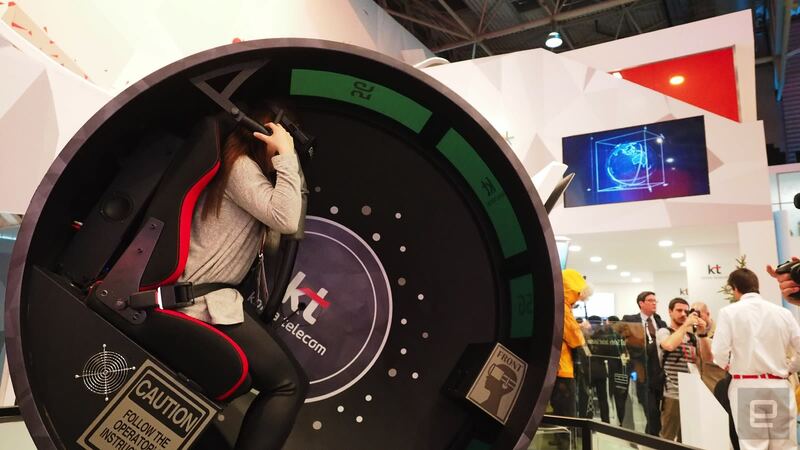 Korea Telecom's 5G VR concept is so intense, you need a safety harness to ride it. I expected MWC to be a roller-coaster ride of emotions, but I wasn't quite anticipating getting on a literal one (albeit in VR) here at the show. When Korea Telecom (KT) offered up a chance to party with K-pop band Twice, I just had to get in line despite not really knowing what awaited me. VR experiences are pretty played out at this point, but Korea Telecom adds a twist by promising to deliver the media over 5G, which it just announced it will deploy commercially by 2019. Of course, since 5G isn't actually a thing yet, we were wired into a computer, and this demo really only showcased KT's ability to create entertaining VR content with a simulator ride. The whole thing looked relatively harmless at first. I climbed into a chair in the middle of what looks like a giant hamster wheel, and KT reps strapped me in with a seatbelt and a roller-coaster-style overhead harness. That should have been my first clue. When I put on the headset, I saw myself sitting in an airplane holding a up a phone playing a Twice music video. Then a flight attendant beckoned me and I followed her towards the plane door (for some unknown reason), which opened to reveal we were up in the clouds. And that's when the madness began, and I descended into a psychedelic, often-terrifying journey that was basically a trippy K-pop music video showcasing Seoul's hotspots. As I slid up and down simulated environments from ski slopes to roller-coaster tracks, the chair I was in spun within the hamster wheel in tandem with what I was seeing while fans blew wind in my face. It was a well-executed experience that had me in tears of overstimulation by the end. For now, the people and scenes in the video are rendered in cartoonish 3D, but a KT rep tells Engadget that the goal is to eventually use actual photographic images. If KT is able to stream such a graphics-intensive clip over 5G by 2017, it'll be an impressive feat. But the question then is: Do people really need to be riding faux roller-coasters outside of their homes (or anywhere they'll use 5G instead of WiFi, anyway)?